The traditional Tang Soo Do classes at Vaughn’s Dojang are designed for children as young as six years old and for adults of any age. Classes are 1-hour long and are held twice a week (on either Monday & Wednesday or Tuesday & Thursday—with additional opportunities for training on Saturday mornings) at our Audubon and Phoenixville locations. Tang Soo Do is a traditional martial art that traces its roots back to ancient Korea. For more than 2,000 years, the art has been passed down from instructor to student. Throughout its rich history, Tang Soo Do has been refined and polished. Grandmaster Jae C. Shin first brought Tang Soo Do to the United States in 1968 and quickly saw it sweep across the country. In 1982, realizing that Tang Soo Do would not be confined to Korea and the United States, he founded the World Tang Soo Do Association. Today, the World Tang Soo Do Association—through its hundreds of thousands of instructors & students in more than 30 countries covering 6 continents—continues to ensure that our art remains the best in the world. The techniques and philosophy are still taught as they were in ancient times, although the system has adjusted to the physical needs of modern lifestyles. This traditional art develops individual character, mental strength, integrity, and respect for others. 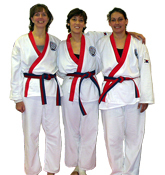 Tang Soo Do is designed to be accessible to students of all ages and all physical abilities. Youngsters with proper motivation can start as early as six, and men and women in their sixties and beyond are actively enjoying this art. Most techniques in Tang Soo Do are performed from a standing position, and kicks and punches are learned without body contact. This way, coordination and flexibility can be increased at any age. A studio certified by the World Tang Soo Do Association and headed by a trained, certified Black Belt instructor is a guarantee of the best martial arts instruction available today. The core of Tang Soo Do training is respect and discipline, two concepts often overlooked in our society. In Tang Soo Do, a child learns respect for authority figures, including parents and teachers, as well as respect for himself/herself and others. Students are expected to conform to the rules of the class during training. The promotion system encourages children to practice and continue training. This disciplined habit of not giving up can eventually be seen in other aspects of a child’s life such as improved school work and the ability to cope better with the demands of everyday life. Tang Soo Do encourages courtesy, patience, loyalty, honesty, and self-control�values that are not specifically taught in most Western sports. Values learned in the dojang give the student concrete, practical guidelines for behavior in his or her life. Martial arts training also helps alleviate the fear most children have about handling themselves if they are physically confronted by someone. One of the basic tenets of Tang Soo Do training is respect. Parents often use this word when asked what they would like their child to learn in a martial arts class. Starting with "yes, sir/ma’am; no, sir/ma’am; thank you, sir/ma’am", bowing to their instructors and fellow students, and how to care for their uniform and other equipment, we teach children a respect for themselves, others, and their surroundings. Children meet new physical and mental challenges of training by following the rules of the class which teaches them self-control as their minds and bodies develop. Instructors lead the children to develop confidence in themselves by giving them an "I can do it" attitude. Children discover self-value and pride as they learn new techniques and achieve higher rank. Through Tang Soo Do training, a child develops both physically and mentally. Coordination and balance will improve. Better mental and physical health improves self-esteem as well as stress-related aspects of a child’s life, such as eating and sleeping habits. The structure of our classes and the rules of conduct (protocol) of Tang Soo Do training, such as bowing and answering "yes, sir/ma’am," help shape the child’s behavior in a positive way. Group training with other children teaches teamwork and interpersonal skills which will prove valuable throughout childhood and into adulthood. Many children want instant gratification, which is common in our modern, technology-driven society. Tang Soo Do training and the progression through our belt system helps children to develop an inner calmness and teaches them to be goal-oriented and to always finish what they start. Tang Soo Do training teaches students eye focus, body focus, and mind focus. Powers of concentration are not only an essential element of martial arts training, but they are critical to many other aspects of life such as academic performance. Children are taught one of the basic codes of Tang Soo Do training—that responsible behavior includes choosing when, where, and why to use their new physical skills, and that they are responsible for their own actions. Children in our program learn that you must not only do the right thing, but you must do the right thing for the right reason—which does not mean that you are doing it because you fear punishment. Being trustworthy and having integrity are also part of the responsibility of every child in every class. By utilizing the traditional Tang Soo Do warrior’s honor codes, our program teaches children to develop their own sense of justice and to mature and grow with a sense of fairness. Instructors help their students distinguish between the right way and the wrong way. The distinctive nature of Tang Soo Do is neither too soft, nor too strenuous for women. The variety of defensive techniques is not equaled in any other martial art form. While practicing self-defense, the various combinations of vigorous techniques condition and tone all muscle groups. Repetition of these techniques will rebuild your body giving you better balance, more agile and graceful movements, and a healthier appearance. Tang Soo Do training teaches students eye focus, body focus, and mind focus. A balanced mind and body promotes confidence, helps to relieve stress, facilitates a happier life, and can also help the body correct a variety of physiological illnesses. Modern families are finding that everyday demands in our society are resulting in weakening family ties as we rush in different directions to accomplish everything that is expected of us. Fun, wholesome activities that can actively involve everyone in the family and draw them together are almost nonexistent. Now there’s a solution... Tang Soo Do! A large proportion of students at Vaughn’s Dojang train with other family members. Parents and children train in the same class and they are each keenly aware of the other’s efforts and accomplishments. When children see important values demonstrated by their own parents, they have strong models to follow. Some of the basic codes and tenets emphasized in Tang Soo Do include: loyalty to country, obedience to parents, honoring friendship, personal integrity, perseverance, self-control, humility, and an indomitable spirit. The World Tang Soo Do Association emphasizes not only physical and emotional development, but scholastic development as well. Students who earn at least all "A"s and "B"s on their school report card are eligible for special certificates of achievement from the Association. Financial assistance is available to college-bound students through the Association’s Scholarship Fund. Call our Audubon Studio at 610-676-0691 or use the Request Information box on our home page to learn more about the programs at Vaughn’s Dojang.